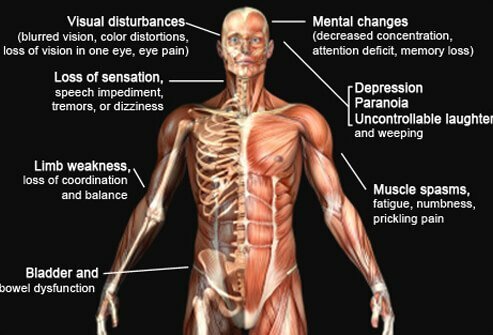 It’s more important than ever to be aware of the warning signs of multiple sclerosis (MS), a chronic and often disabling autoimmune disease. While more than 400,000 people in the United States and 2.3 million people worldwide have MS, someone gets newly diagnosed every hour, according to the National Multiple Sclerosis Society. Do you know what symptoms to watch for? According to Tanuja Chitnis, MD, assistant professor of neurology and director of the Partners Pediatric MS Center at Massachusetts General Hospital for Children, early symptoms of MS can include blurred vision, loss of vision, and/or numbness or tingling that lasts for several days. Dr. Chitnis indicates that while any symptoms of MS — including problems with motor skills, bladder control, and coordination and balance — can manifest at any point in the course of the disease, she has noticed that blurred vision and numbness tend to be symptoms common to the initial diagnosis and earlier stages of MS.
Everyone has experienced the temporary pins-and-needles numbness that accompanies resting on your arm or leg in the wrong way, but this feeling tends to go away within a few minutes as blood flow returns to the area, Chitnis says. The key to determining whether a symptom might be due to MS, she says, is timing; MS symptoms develop over the course of several days, and can last for several days to a few weeks. Vision loss. Eye issues are often the first sign of MS. Before he received his MS diagnosis, for example, Jeffrey Gingold noticed that his vision was beginning to rapidly decline in one eye. Gingold was 36 at the time, making such dramatic vision loss extremely unusual. He scheduled an appointment with his regular eye doctor, and remembers the ophthalmologist telling him, “You either have MS or you have a brain tumor.” An MRI (magnetic resonance imaging) confirmed that it was MS.
Balance. Balance and dizziness are also common initial signs of MS. Rick Sommers, a fit and athletic guy, was diagnosed with MS in 1994. “I was training for a marathon and my balance was off,” he recalls. “I felt lightheaded. I went to a doctor who thought it was an inner ear infection. I was misdiagnosed.” In fact, his balance issues were Sommers’ first symptoms of MS.
Numbness or Tingling. After his initial balance difficulties, Sommers began to notice tingling and numbness in his right side, which motivated him to see a neurologist. The neurologist ordered an MRI and found lesions in Sommers’ brain that indicated MS was what was causing his symptoms. Heat intolerance. Heat intolerance is another telltale sign of MS. If you feel dizzy, faint, or unusually uncomfortable in warm temperatures or when engaging in body-warming activities like soaking in a hot tub, exercising, or sunbathing, it could be a sign of MS. Heat intolerance also tends to make other symptoms of MS more pronounced. Some of these symptoms are common to many disorders, and Chitnis emphasizes the importance of timing in figuring out if the symptoms could be caused by MS. If you are experiencing any of the symptoms above, for a period of more than 24 hours, there is a chance that MS is the cause. Of course, any symptom that interferes with your job performance, daily functioning, or quality of life is worth discussing with your doctor, whether or not you suspect it might be related to MS. For many diseases, the earlier they are caught, the more effective treatment will be. MS is no exception. Treatments are now available that can effectively slow disease progression, and initiating them as early as possible is generally the best course you can take.